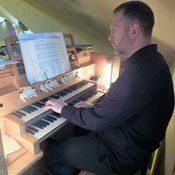 I live in the city of Salford, Greater Manchester and have been organist at Salford Cathedral since the year 2000. I am available to play for weddings, funerals or any other event requiring live music. 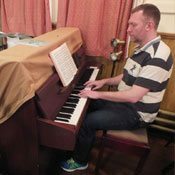 Brought up in the Catholic faith, and with over 25 years’ experience of choir/congregational accompaniment and church musical liturgy behind me, I am first and foremost a church musician, but outside of this sphere, I also work as an accompanist, recitalist and solo entertainer. I enjoy playing pieces that showcase the amazing versatility of the organ: a musical instrument capable of expressing itself from the loudest roar to the quietest whisper. 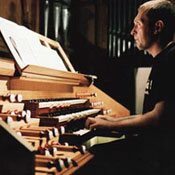 When given free reign, I often like to mix classical church organ with theatre organ style, adapting my playing technique in a way that has audiences smiling in delight. However, always sensitive to the wishes of my client and mindful of the occasion, I’m always ready to set a more serious tone whenever it is required. I have an eclectic taste in organ music that can grace the most solemn and ceremonial moment with the decorum it demands. I am originally from Liverpool and began my musical career at the age of 11 when I began to have piano lessons with the son of a family friend. Brought up in the Catholic faith, I regularly attended the local parish church of St. Thomas More, Aigburth (sadly now defunct) with my family. At the age of 12, the parish priest noticed my fascination for the church organ and for its organist, a lovely retired old school music teacher called Flo McGowan, and encouraged me to take up organ lessons. I subsequently studied the organ, first with Richard Lea (formerly organist at the Metropolitan Cathedral in Liverpool) and then with Simon Leach (organist of the Holy Name Church in Manchester). I eventually took over as organist at St. Thomas More, when Flo stepped down due to her failing health. News of my playing eventually reached the Liverpool clergy, thanks in no small part to the business cards I had circulated around the local churches. Soon I was in regular demand for weddings, funerals and various other religious services that took place outside my regular Sunday playing commitments. When I was 18, I moved to Manchester to embark on a four year course at the University of Manchester, reading French and Latin. I applied for a scholarship at Salford cathedral and was successful. Following a year’s absence from September 1997 to August 1998 in which I spent a year abroad in France, I resumed my scholarship role, and after the sudden resignation of the then present incumbent, I was offered the job as principal organist in 2000. I have remained there ever since. During my musical career, I have accompanied at many concerts at venues all over the North West, and played at numerous recitals home and abroad. In addition, thanks to my position as organist of Salford Cathedral, I have been involved in several broadcasts for television including ‘Morning Worship’ (1996), ‘Songs of Praise’ (1999) and ‘My Favourite Hymns’. I have been privileged to work with several choir ensembles in the North West, accompanying popular works such as Fauré’s Requiem with Todmorden Choral Society in 2003 and 2009, and Haydn’s ‘Creation’ with St. Helens Choral Society in 2007. In my leisure time, I’ve also done piano accompanying for local operatic societies, like Woodhouses A.O.S. at their annual production of classic Gilbert & Sullivan operettas, most recently ‘The Pirates of Penzance’ (2014), ‘The Sorcerer (2015) and ‘The Mikado’ (2016). In 2014 I became the official accompanist for local singing group, Monton Voices, and regularly perform at their concerts which take place throughout the year. Their website can be found at www.montonvoices.com along with some recordings of their performances. 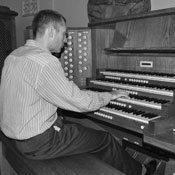 Having playing at countless weddings throughout my playing career, I can draw upon a broad repertoire of organ music spanning from classical to contemporary, to suit any occasion and taste. Sometimes the type and size of the instrument itself can to a certain degree, dictate the type of music that can be performed on it. There are occasional moments, where spontaneous music is required and there is no time to look for a piece that will fit the bill. In such instances I will improvise music, whether to extend the ending of a hymn, to serve as a prelude to a hymn, to cover periods of silence in the church service such as communion, or to cover an action that is taking place. For example, when the priest is incensing the altar. When I am not playing the organ, I do like to go back to my roots as a pianist. I like light classical pieces, Scott Joplin piano rags, Jazz music and popular songs. I have in the past played piano for private functions and parties also. My repertoire of popular songs ranges from the top-tapping tunes of the roaring 20’s such as ‘Back in your own backyard’ and ‘Ma he’s making eyes at me’ to uplifting love songs of today like ‘You raise me up’ and Adele’s cover version of the Bob Dylan ballad ‘Make you feel my love’. There are video recordings of me playing some of my repertoire on YouTube – below are a few examples that I hope you will enjoy. Feel free to take a look at my YouTube channel for more examples of me in action. I have been playing for weddings since the age of 13, which amounts to over 25 years’ experience. With a collection of pieces that range from hauntingly beautiful adagios to majestic trumpet processionals, I will play to suit your particular tastes. I’ll even keep the wedding guests entertained with music beforehand until the bride arrives and is ready to walk down the aisle, even if she is late! 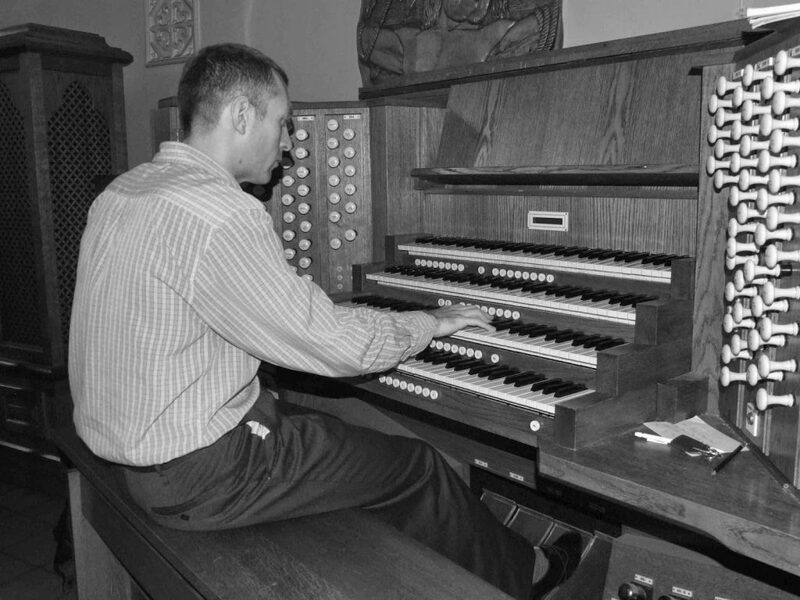 In the case of church weddings of course, the most important thing to do before hiring an organist, is to check whether the church has their own organist or not, because if it is the case, then they normally will be asked to play. 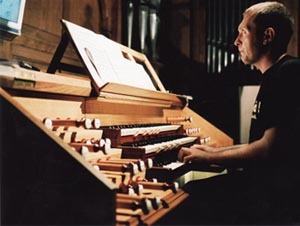 In the Church of England, the organist has legal status as an employee, and may potentially have as part of his or her work contract, the right of first refusal. 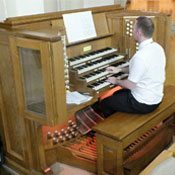 What this effectively means is that, if a family wish to hire their own organist from outside, they need to consult the permission of the resident organist first. If that permission is given, the organist is nevertheless entitled to the fee (sometimes known as a bench fee) that he or she would have received from the wedding. The reason for this is simply to safeguard the organist’s income. An organist’s salary is calculated on the assumption that they will get a certain amount of weddings and funerals a year on top of their normal commitments. The organist has no such status in the Catholic church in England. Classical music remains by and large the number one choice for weddings, but it’s your day, and your decision. I have been asked to play pop music on more than one occasion. If you require music to be played that lies outside the usual repertoire though, then as much notice as possible needs to be given. I will always try and play any requested music, even if it requires purchasing it from a music store or digitally downloading a paid copy. In such an event, a small charge may be added to cover the cost of that music. I have occasionally played at the celebrity weddings but by and large, most of the weddings I do are for everyday couples like you. My usual fee for a wedding is around £100 -£120 (plus travel expenses if applicable). I do appreciate the considerable costs involved in organising a wedding so I am prepared to negotiate the price in exceptional circumstances. Some organists will not allow their playing to be recorded or if they do, will charge an extra performing right fee, which can potentially be 100% of the normal fee (or 50% if just an audio recording is made). It is their right to do so, and they are legally protected by the Copyright, Designs and Patents Act of 1988 (see section 182). However, in the current age of camera phones and other smart phones, it is almost impossible to stop people from recording, so some organists ask for an extra inflated fee up front to compensate for the fact that the performance is likely to be recorded. My personal policy is that I do not charge any extra for a recorded performance. I have charged my fees on the understanding that you have my full consent to film, broadcast or record me playing without having to seek my permission beforehand. There is a wealth of music for weddings. The most popular pieces can be found below. This will hopefully help you in making your choice of music for the big day. 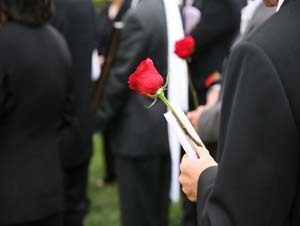 Although playing the organ for funerals and requiem masses is something I do on a very regular basis, funerals are unique in that my services are always hired through a third party, namely the funeral directors or the priest. I therefore include this section mainly for informational purposes only. The death of a friend or family relative is always an emotionally difficult time, but of course it is inevitable that at some point, you will probably be involved in discussing funeral arrangements for a dearly departed family member, and this includes of course, the music. The funeral arranger will discuss the choice of music in church with you (hymns, entrance and exit music), and whether an organist or other musician is required as well as other matters like flowers, donations, service booklets etc. and then liaise with the priest or minister. If the church has no organist available, the funeral arranger usually has a list of organists whose services they can call upon. This is where I will typically get involved as my name is registered with a few funeral companies. It would be very rare for me to have any direct contact with the family itself, although it can happen, particularly if they have any special musical requests or if I am known to them. Abide With Me (Eventide); The Day Thou Gavest (St. Clement); The Lord’s My Shepherd (Crimond); How Great Thou Art (O Store Gud); Amazing Grace (New Britain); Morning Has Broken (Bunessan); Be Thou My Vision (Slane); I Watch The Sunrise; Dear Lord And Father Of Mankind (Repton); Be Still my Soul (Finlandia); Do Not Be Afraid; Make Me A Channel Of Your Peace; Love Divine, All Loves Excelling (Blaenwern). Unlike weddings, there are no traditional pieces of music closely associated with a funeral, unless you count the famous and heavily clichéd funeral march by Chopin. The most requested piece of music I have been asked to play surprisingly enough is the Londonderry Air, better known as ‘Danny Boy’. Since a good number of the funerals I play at are Irish Catholic, this is little surprising. Another piece I am often asked to play is’ Ave Maria’. However, people don’t always seem to realise that there are several versions of it in existence as when I ask them which one they would like, they are unsure. The two most famous versions of the’ Ave Maria’ were of course written by Gounod (based on a prelude by Bach) and Schubert. In a drive to make funerals more tailor-made for the individual, families are increasingly requesting pop music in church. This is typically played during the procession of the pallbearers and family members into church, and again on exit. Pop music can sometimes be played by the organist (if the organist is willing or able) but more often than not, is provided from a CD or MP3 portable playing device. I am not an advocator for recorded music, so if a family insisted on a certain song or melody because it held some significance to them, I would much rather play it on the organ than for it to be pumped out through the church speaker system or some other portable device.